Starbucks, Rainy Days, Chihuly and More! Seattle is all about a bunch of grungy hippies sipping coffee in the rain, right? Well, not quite. But Seattle is famous for a few of those things—often for good reason. 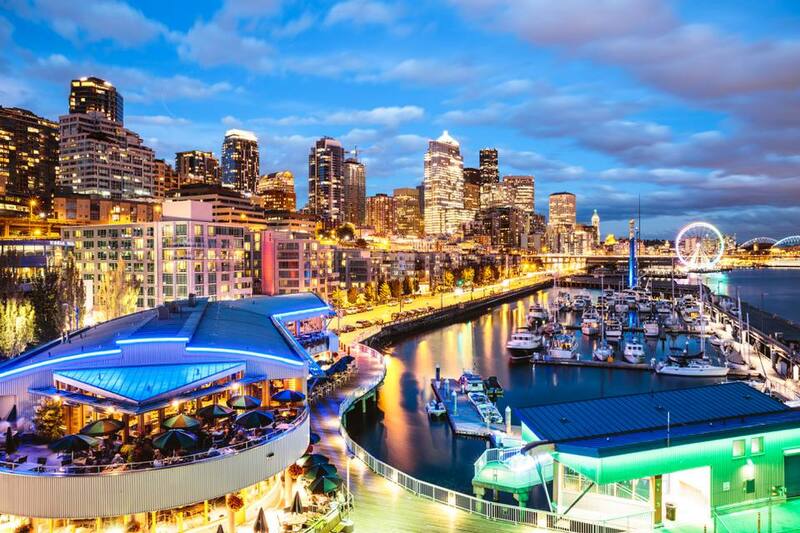 Seattle's unique location sandwiched between the Puget Sound and the Cascade Mountain range, its tech boom and its love for coffee (and wine and beer) all help make up the fabric of the city and are all parts of the reasons why people move here to work, live and play. Seattle is home to a few coffee chains that have gone international—Starbucks, Seattle’s Best and Tully’s among them. While native Seattleites have varying opinions on whether brand-name coffee is acceptable or not, the fact is that there’s no shortage of coffee houses and cafes in Seattle, be they major chains or indie cafes. Seattleites (and Northwesterners in general) love their coffee. And why not? The climate is often cool. The winters are short on daylight and mostly rainy. Let’s face it. Seattleites need the precious boost that is caffeine! Seattle has a bit of a reputation for being rainy, but the weather really isn’t as bad as it’s made out to be! While days of full sun each year number just around 60, this doesn’t mean there aren’t plenty of sun breaks. The city only averages 37 inches of rain annually, less than Chicago, Miami, and Portland to the south! So why does Seattle have such a rainy reputation? The answer is that when it does rain, it rains for a long time. Rather than East Coast cities that rack up the annual inches of rain in impressive thunderstorms, Seattle’s rain tends toward soft drizzle—so that 37 inches goes a long way. It’s been a while since Grunge took over the music scene, but many people still associate Seattle with long, dirty hair, flannel, and heavy guitar riffs. In fact, most of the Grunge bands that made it big in the 1990s were from Washington State or have ties here, including Nirvana, Pearl Jam, Soundgarden and Alice in Chains. Judging by how often Nirvana and Pearl Jam still make it onto local radio stations, Seattle natives still have a soft spot in their hearts for Grunge, too. Seattle got a lot of attention in movies, mostly in the 1990s with hits like “Sleepless in Seattle” and “Singles.” Several movies were also filmed in Tacoma to the south. Even TV got in on the action with “Frasier” set in Seattle…even though it wasn’t really filmed in an apartment building with an amazing view of the city. Hey, at least there was a piece of Chihuly’s artwork in Frasier’s apartment. If that doesn’t make it local, what does? Some of the country’s top Fortune 500 companies are located in and around Seattle. These vary from Starbucks to Amazon to Microsoft and Costco but also include companies that don’t get as much press, like trucking company Paccar. Seattle's big business and industry not only brings many new transplants to the city but also keeps the local economy strong. Most of the country can only stand in awe of the mountains and nature in and around Seattle. Green spaces and parks are located all around the city. Discovery Park alone offers 534 acres of forests, beaches, and meadows. Snowcapped Mt. Rainier is visible on the horizon. Because of the plethora of evergreen trees, the entire area stays green all year round. There’s a reason Seattleites are some of the most active people in the U.S.—it’s because even when there is rain, going outside is still amazing! Seattle and Tacoma are both major glassblowing hubs, thanks in large part to Tacoma native Dale Chihuly, one of the best-known glass artists in the world. In 1971, Chihuly helped to found the Pilchuck Glass School in Stanwood, Washington, which still serves as one of the world’s best glass arts educational centers and brings many glassblowers into the area—as artists-in-residence, teachers, and graduate students. The Seattle area is also home to countless other glassblowing schools, programs and even in-school programs for area youth. Chihuly’s artwork is especially prolific—Tacoma’s Bridge of Glass showcases several hundred pieces, the Museum of Glass includes pieces by a wide variety of glassblowers, or take a walk through downtown Tacoma for a look at several more. Seattle and other surrounding cities have their fair share of famous people, all the way back to Bing Crosby (born in Tacoma) up to Kurt Cobain. Seattle seems to help musicians blossom. Kurt Cobain, the Wilson sisters of Heart and even Jimi Hendrix are just a few more Seattle music scene alum. Maybe there’s something about all the rain that helps creativity sprout.